Nagore is a town in the Nagapattinam District, Tamil Nadu. The prime attraction is the renowned Nagore Dargah, a revered place of all faiths. A five centuries old Islamic shrine, Nagore Dargah attracts millions of pilgrims irrespective of caste, creed or religion. 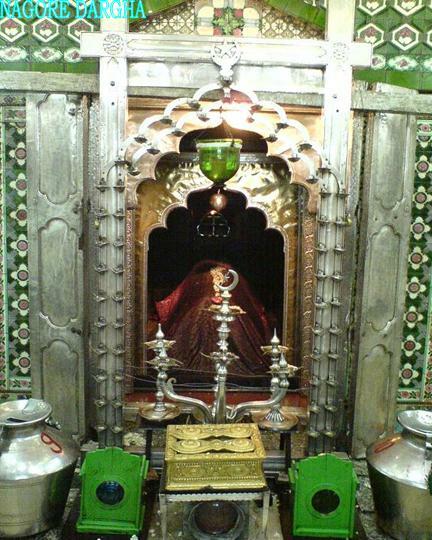 Nagore Dargah (also called Nagoor Dargah or Hazrat Syed Shahul Hameed Dargah) is a dargah built over the tomb of the Sufi saint Hazrath Nagore Shahul Hamid (1490–1579 CE). Shahul Hamid is believed to have performed many miracles in Nagore, and cured the physical affliction of King Achutappa Nayak, a 16th-century Hindu ruler of Thanjavur. He is locally referred to as Nagore Andavar, meaning the "god of Nagore". Nagore dargah as it stands now is believed to have been built by ardent devotees of Shahul Hamid, with major contribution from Hindus. There are five minarets in the dargah, with the Hindu Maratha ruler of Thanjavur Pratap Singh (1739–1763 CE), building the tallest minaret. The dargah is a major pilgrimage centre that attracts pilgrims from both Islam and Hinduism, symbolizing peaceful coexistence between the two religions. Common worship practices at Nagore dargah include the presentation of offerings, accompanied by the playing of musical instruments like nadaswaram, atypical of Hindu religious tradition. The Shifa Gunta, a pool within the precincts of the dargah, is considered sacred; pilgrims take a holy dip in it. Kanduri festival is a 14-day annual event celebrated during the urs (death anniversary) of the saint. The festival is celebrated in commemoration of the anniversary of the saint's death, and pilgrims participate in the rituals and rites. The word kanduri is derived from the Persian word for table cloth. The festival is also called Qadir Wali Ke Fande festival. A saffron flag-carrying ceremony is also observed, during which a flag is carried from a devotee's house to the dargah, accompanied by a procession in streets. The flag is hoisted on a tree known as Fande ka Fahad by a Sirang (hereditary trustee) who is assisted by twenty assistants. The Islamic rites performed during the festival include the recitation of Quaranic verses and observance of Fatiha (it includes; recitation of Al-Fatiha an essential part of daily prayer and Durood). The main attraction of the festival is the presence of Fakhir Jamas (mendicant priests) and Qalandars—the disciples of the saint who witness the festival. On the 9th day of Jamathul Akhir month in the Islamic calendar, at 10 p.m., a pir (one of the disciples) is chosen for the spiritual exercise of offering prayers to the saint. The disciple throws lemons at the end of the prayers on devotees, which is believed to provide miraculous relief to worldly sorrows. Pilgrims from both the religions from the state and also from Sri Lanka, Burma and Gulf countries, attend the festival. In the evening of the ninth day of Akhir month in the Islamic calendar, a chariot containing sandal paste (locally called santhanakoodu) is pulled across the streets of Nagore by pilgrims and devotees, accompanied by banging of instruments. The sandal paste is received by the saint's descendants and used to anoint the Rowla Sharif (sanctum) of the saint by the Khalifa of the dargah.